Whirlpool just got sucked into the vortex of global turbulence. The washer and dryer maker's sales in North American were positive. But they tanked in almost all overseas markets, rocked by slow growth and the strong U.S. dollar. Whirlpool (WHR), the world's biggest appliance manufacturer, has become the poster child for the deep challenges facing multinational companies these days. - Latin American sales plunged 22%. - Revenue fell 8% in Europe, Middle East and Africa. - Asia sales dipped 2%. By comparison, sales of Whirlpool's refrigerators, washers and dryers jumped by a healthy 4% in North America and industry shipments are expected to rise the rest of the year. Overall, companywide sales were down 4% last quarter. Whirlpool CEO Jeff Fettig acknowledged the "challenging environment" during a conference call with analysts on Tuesday. Whirlpool stock slumped 6%, its biggest selloff since early December. The stock is among the worst performers on the S&P 500 on the day, though it remains up nearly 20% this year. The economic crisis in Brazil is exacerbating its losses in Latin America. The appliance company said industry shipments are likely to drop 10% in Brazil, which is suffering its deepest recession since the early 1990s. And some other emerging markets are in a similar situation. Whirlpool pointed to "extreme volatility" in Russia, which is grappling with the oil crash and economic sanctions. Multinationals like Whirlpool also face challenges from the U.S. dollar, which in recent years has soared against rivals. 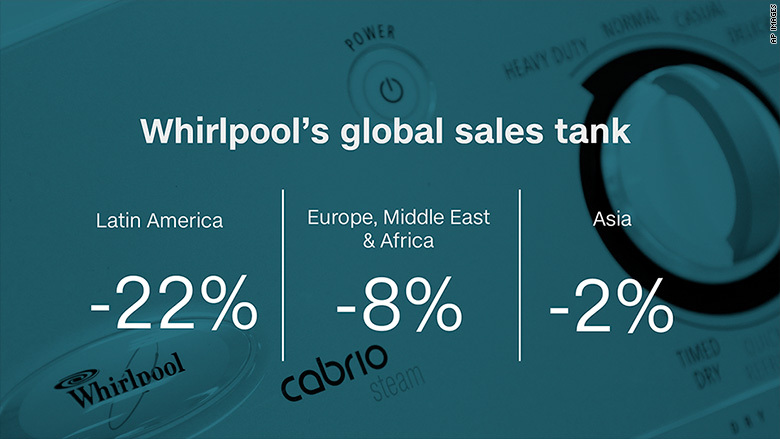 A stronger dollar makes products like Whirlpool's more expensive for overseas buyers. The currency fluctuations also decrease the value of international sales when they're converted back to U.S. dollars. Whirlpool said its total sales would've been up 1% if it weren't for currency movements. The good news for Whirlpool and other global companies is that the currency trends are reversing. The U.S. dollar has lost serious ground against rival currencies this year thanks to the Federal Reserve dialing back its plans for interest rate hikes.